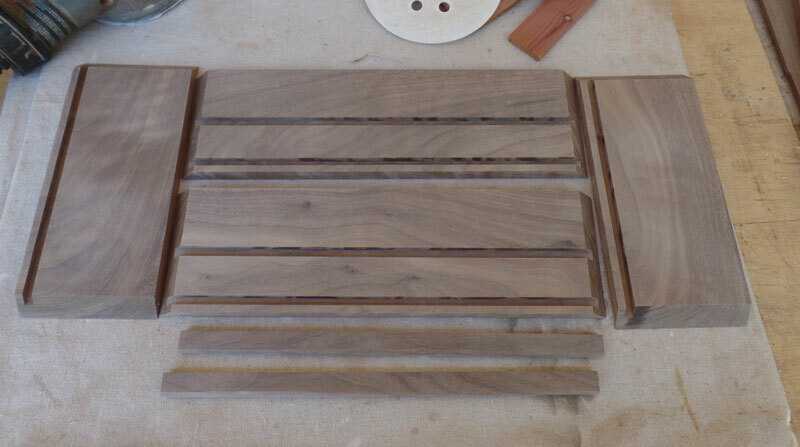 The tray support will be two pieces of walnut about 1/4" wide so I need to cut a groove in each of the long sides for those pieces. I'll cut those grooves the same way I cut the grooves for the bottom. The question is "Where?". 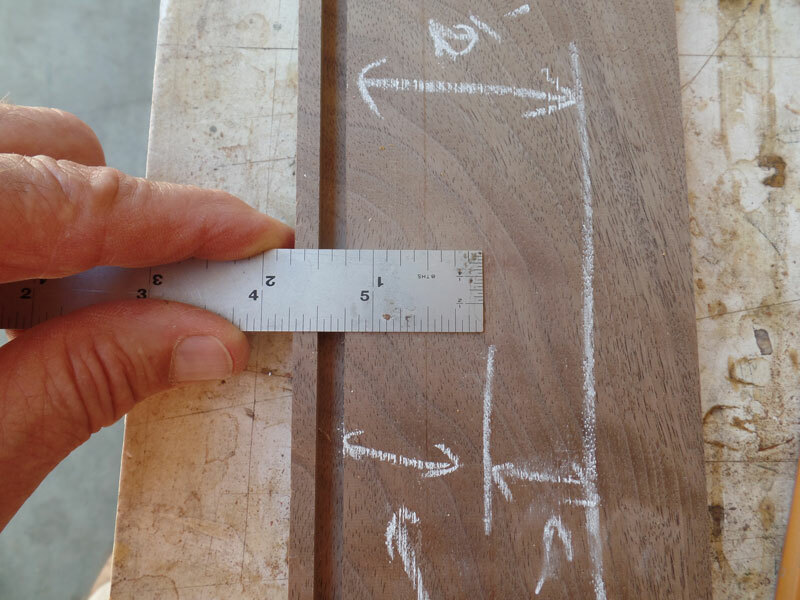 I know that I want the support 1 1/4" from the bottom so I lay my rule on the side with the 1 1/4" mark at the top of the groove for the bottom. Then I read the rule at the bottom of the side. It's about 1 3/4". I'll use that to set the fence on the table saw. 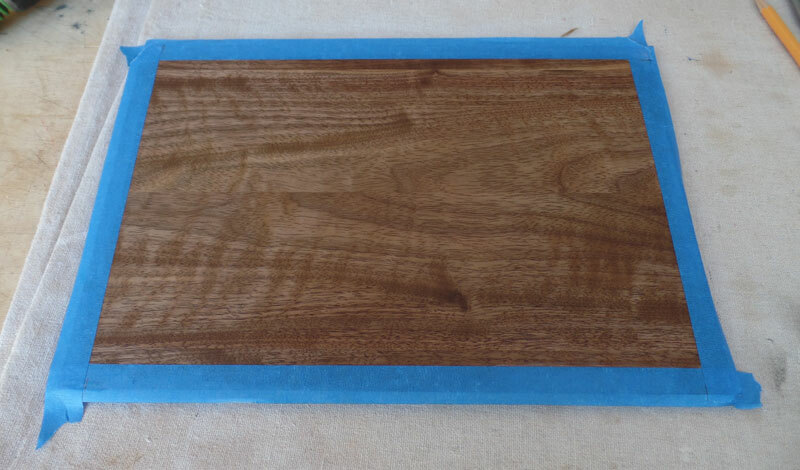 I next cut two pieces of walnut, about 1/4" thick and about 5/8" wide. These will be the tray supports. Here's a close-up of those two pieces, one standing on edge, one laying flat. 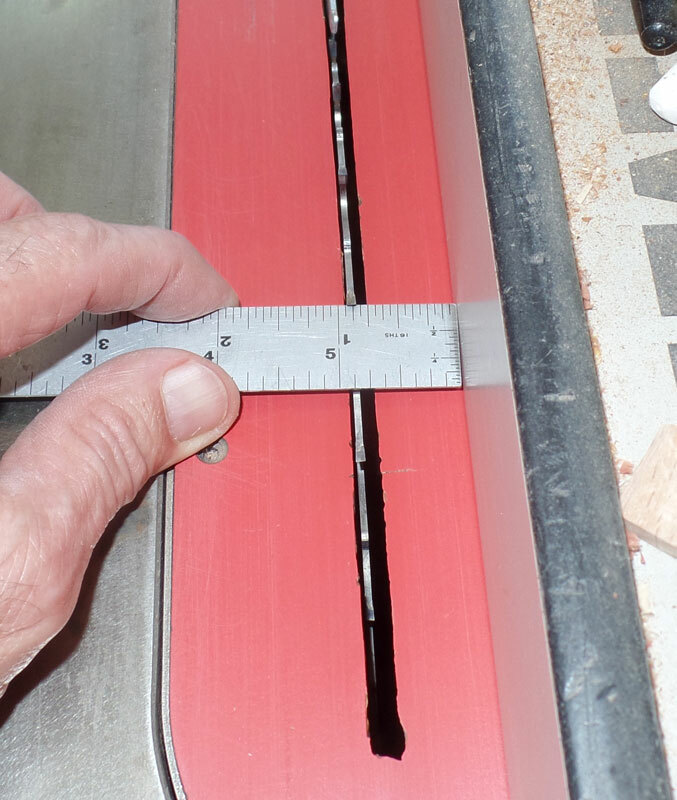 Cut the grooves - on the long sides ONLY - exactly the same way as you cut the grooves for the bottom. Fit the supports into the grooves. Note that the supports should extend only to the end of the miter. If you make them too long, you won't be able to assemble the box. Better a bit too short than too long. 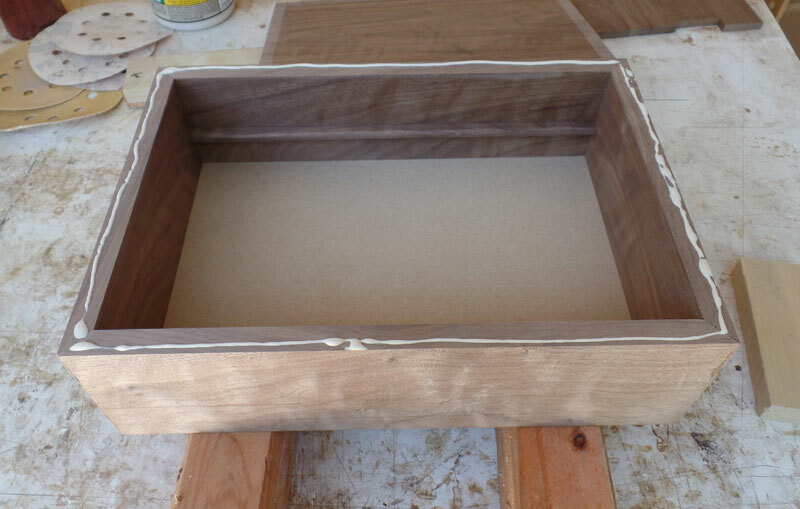 Then sand the inside of the side pieces and the tray supports. This is a good time to soften the edges of the tray supports. 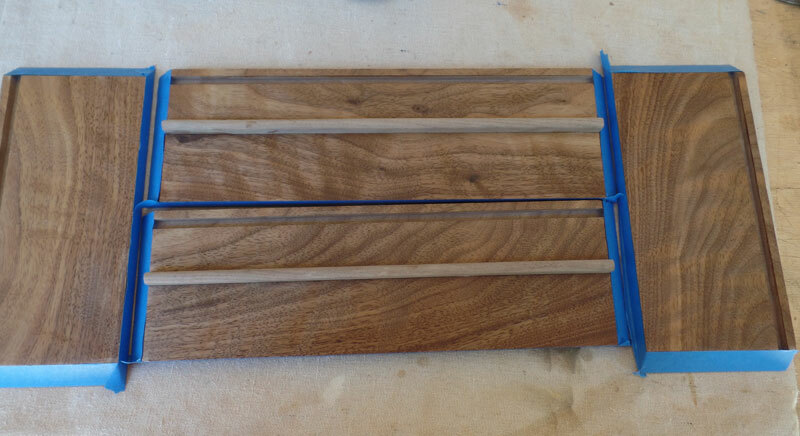 Put blue tape on all the glue surfaces in preparation for finishing. I used a solvent based wipe-on poly. 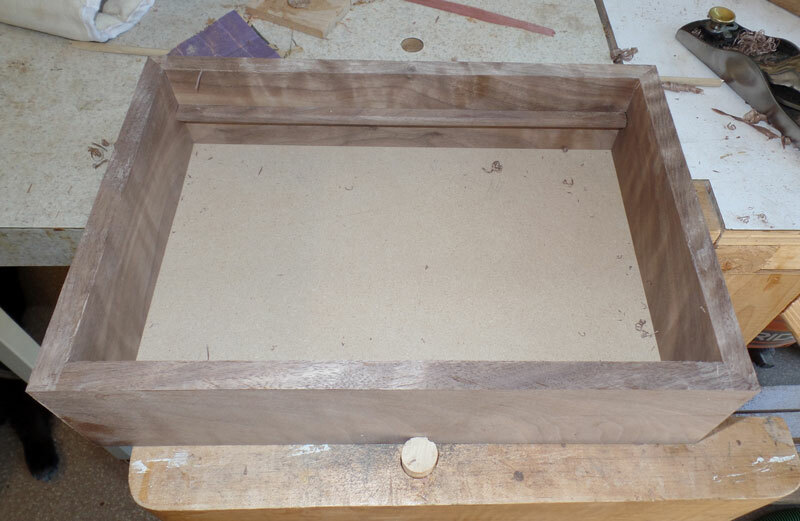 Then glue in the tray supports. You just need a small amount of glue - you don't want glue squeezing out all over your sides. 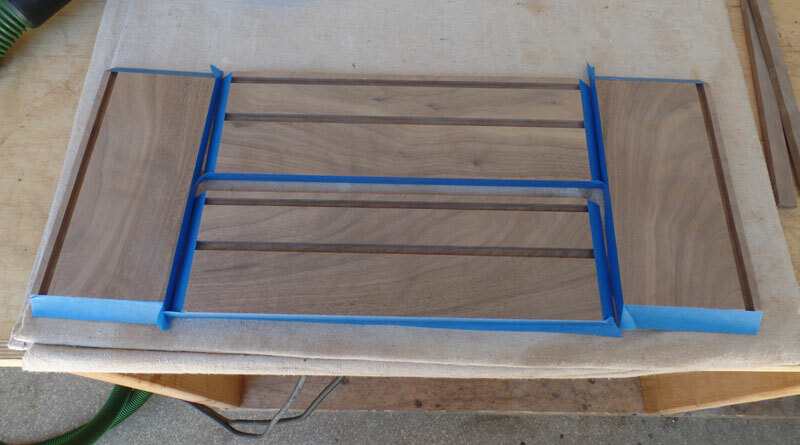 And put the wipe-on poly on the tray supports. Just one final comment on tray supports. 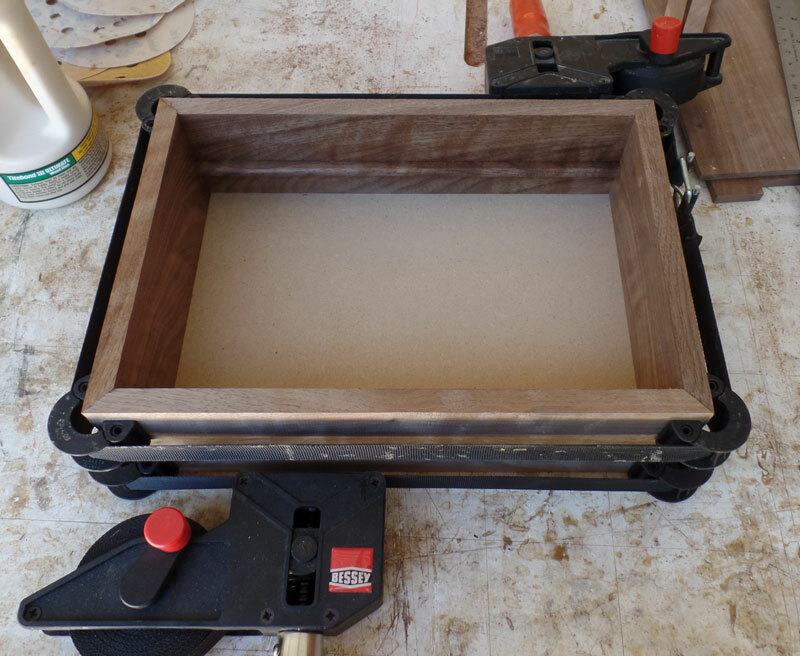 The advantage of this kind of tray support is that you can make a tray that does not go completely across the box but can slide from side to side for access to things in the bottom. 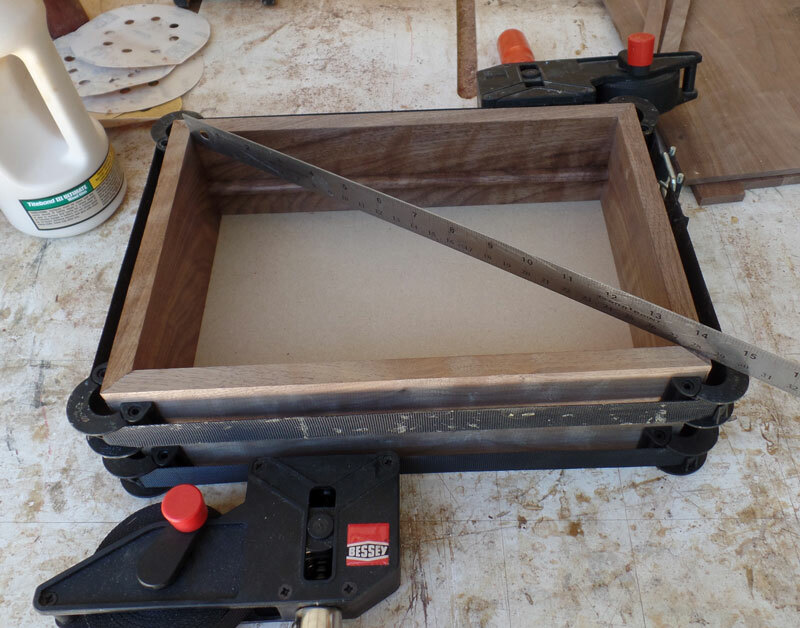 If you want to put a tray in that goes completely across the box, there's another way of supporting it that is less work. Now we're ready to assemble the box. Make sure the sides are laid out in the proper order. 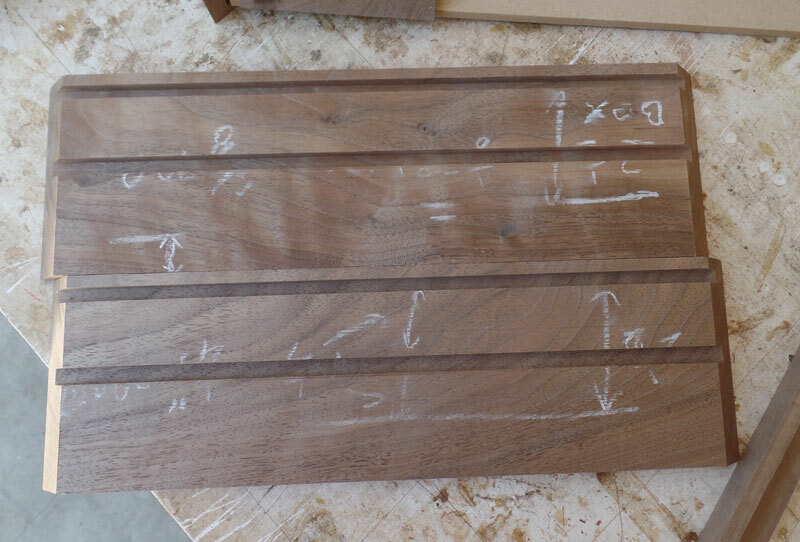 Then do the glue-up. 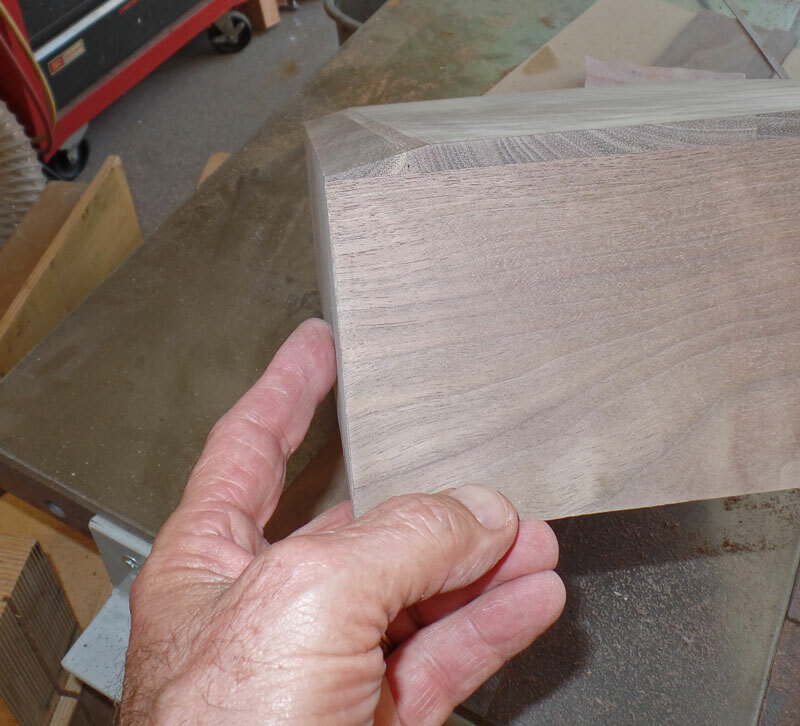 Again, you don't need a lot of glue on the miters. You don't want squeeze out on the inside. Two sets of strap clamps are nice but you could use regular clamps. It's just a bit more unwieldy. Check corner-to-corner to make sure the box is square. 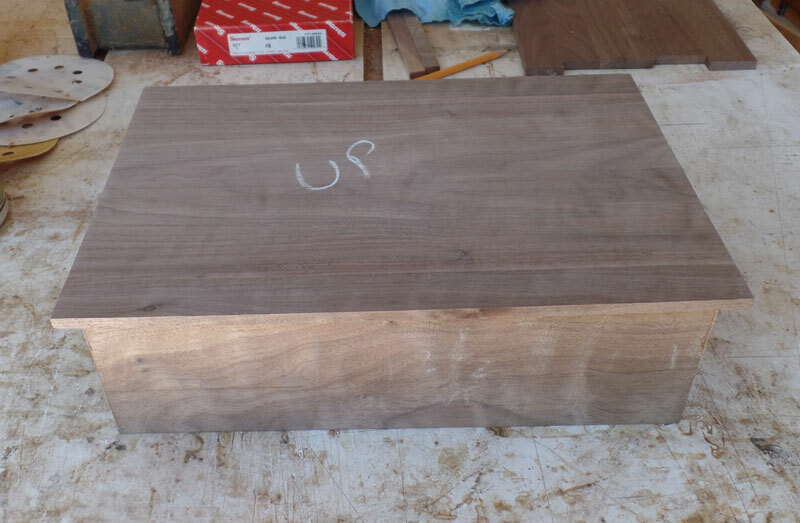 Here's the box after taking it out of clamps. 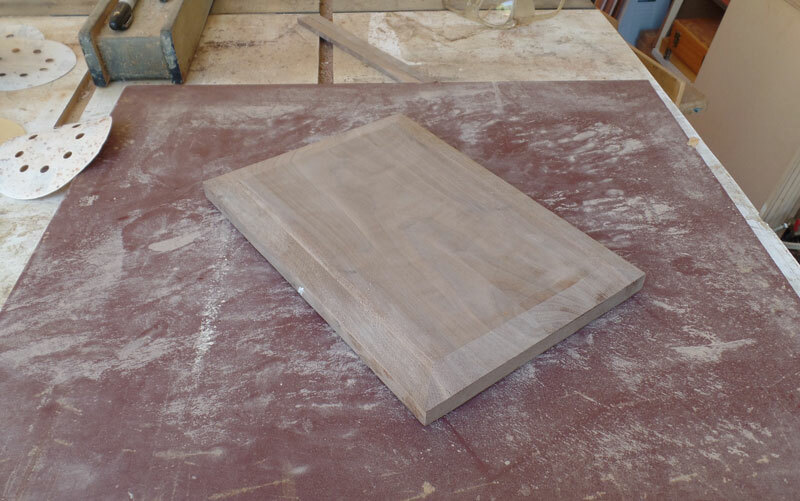 I need to talk here about a special "tool" for boxes - a sanding board. 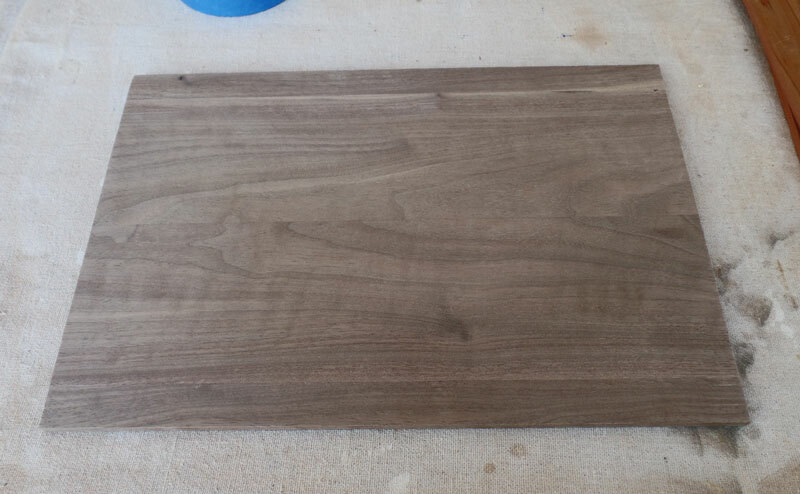 It's coarse sandpaper (100 grit here) glued to 3/4" MDF. 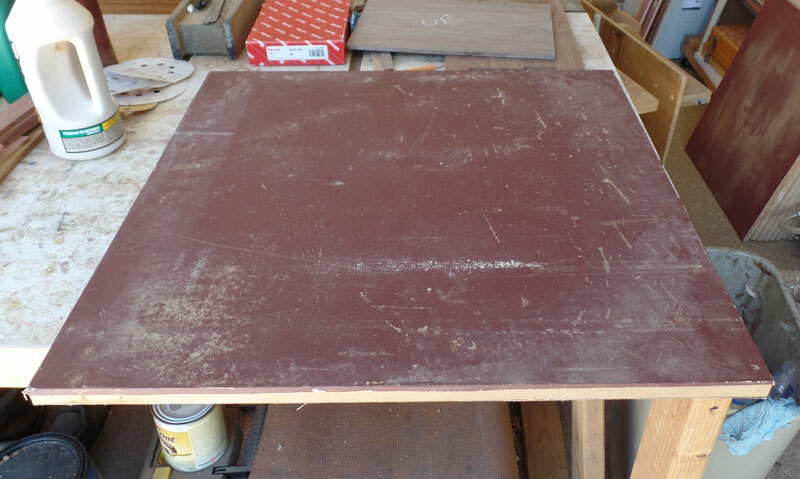 The sandpaper is from a belt used in a large belt sander. You can sometimes find someone selling an old one where the seam has become unglued, but even if you have to buy a new belt they aren't terribly expensive. 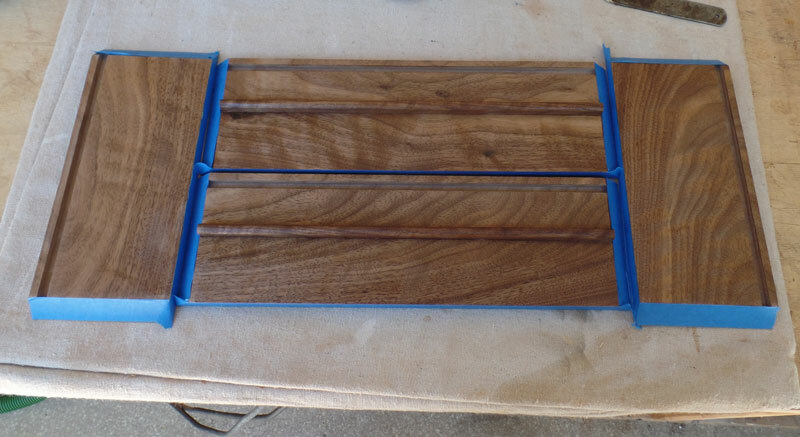 One belt will make several sanding boards so if you have a woodworking friend, the two (or three) of you can split the cost. If you make your own, use a non-water based glue, such as 3M 77 or 90 spray glue. 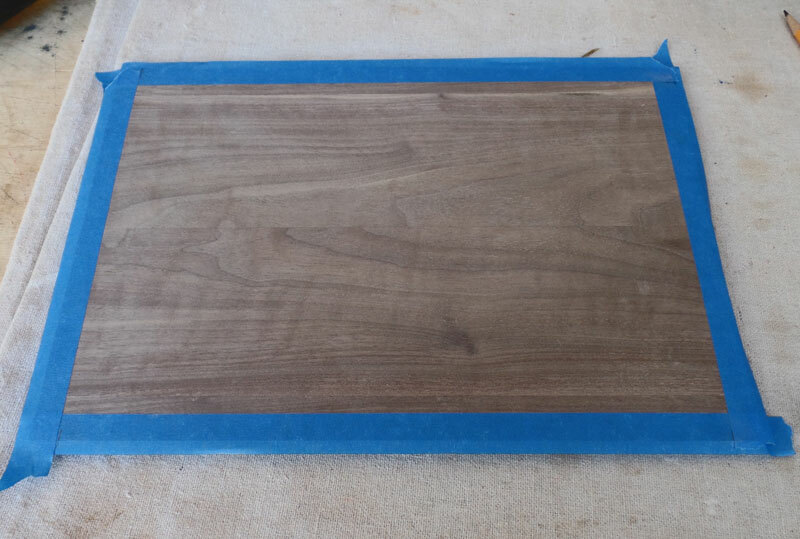 If you use a water based glue, the MDF will warp and the sanding board will not be flat. 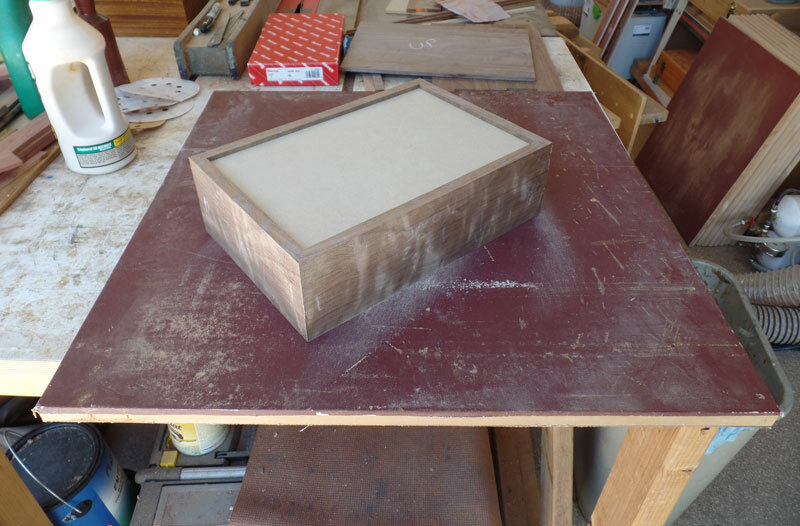 Place the box upside down on the sandpaper and move the box around. 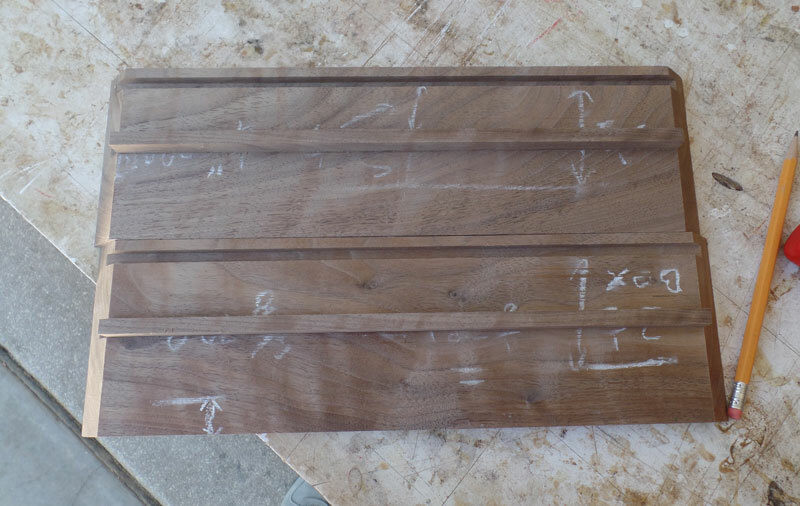 The sanded part will be flat. 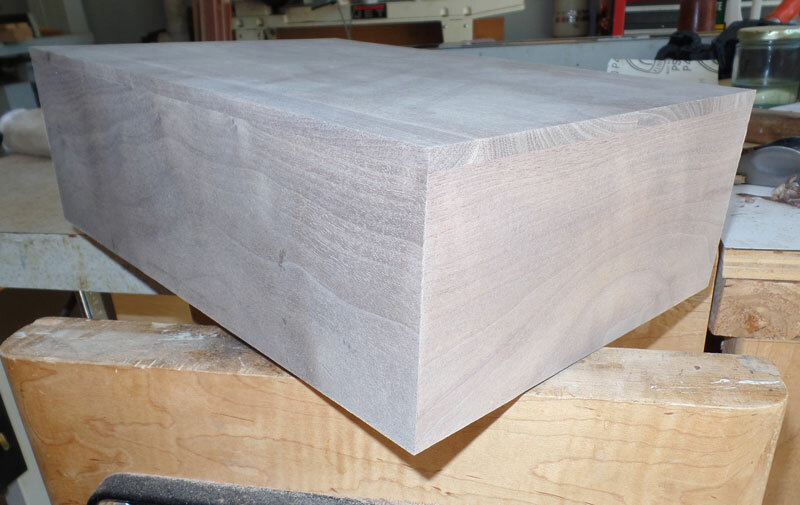 Here's what the top of the box looks like after sanding. We can put the top on and there will not be any gaps in the glue seam. 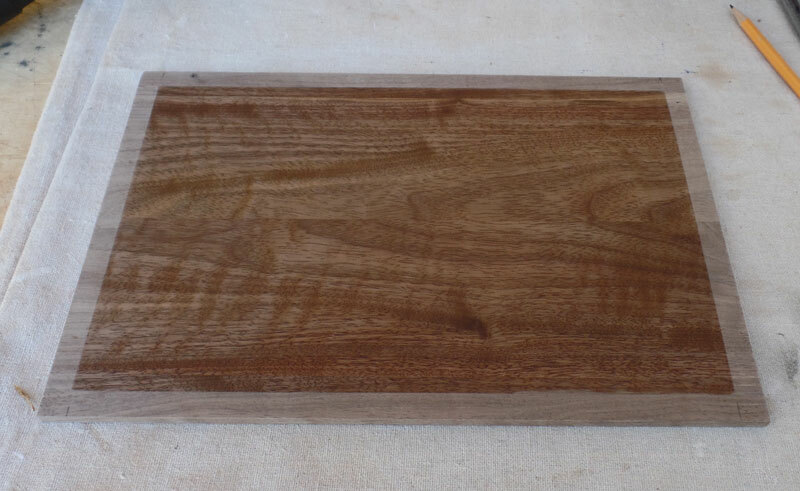 Here's the top I made, but it's only about 1/4" thick. 1/2" would be better. It's too big so we have to trim it. You want it just a bit big. When gluing, the top can move so you want some excess to accommodate that. We will trim it smooth after gluing. 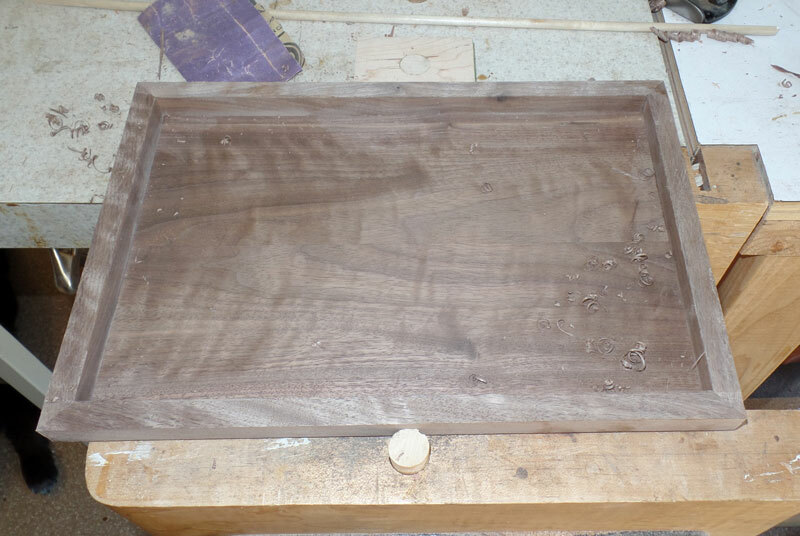 Before gluing, I'm going to sand the inside and finish it with wipe-on poly, just as I did for the inside of the sides. Here it is sanded. 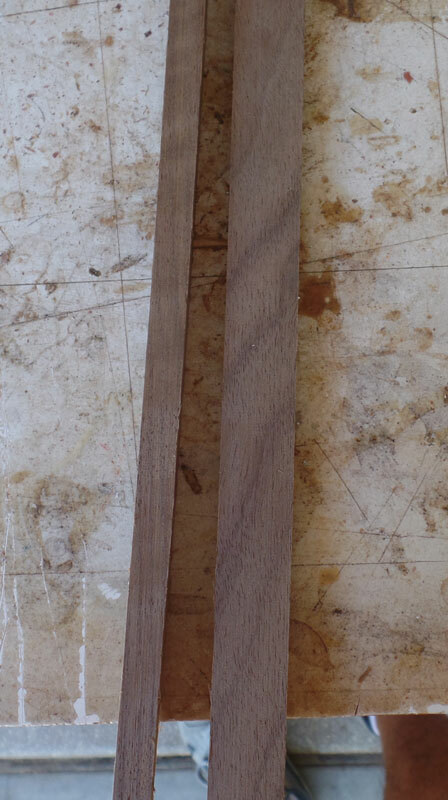 Then, I'm going to mask off the outside 1/2" or a bit less. 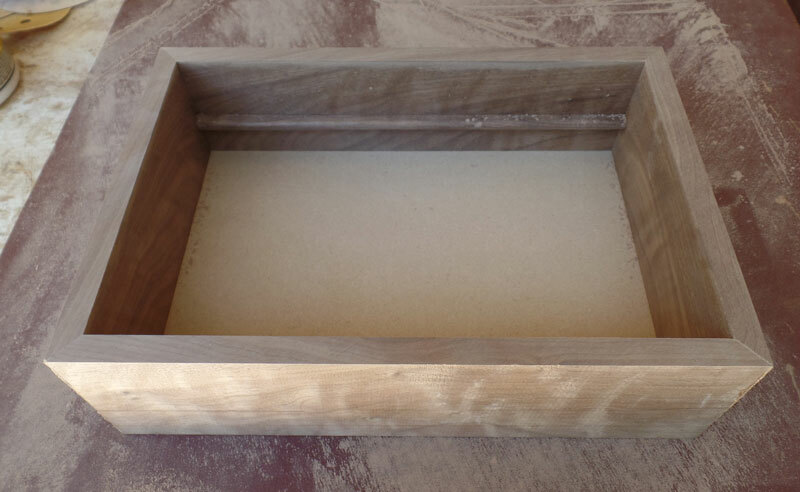 I need raw wood for the glue to adhere, but I want to make sure that no raw wood shows on the inside after the top is glued. 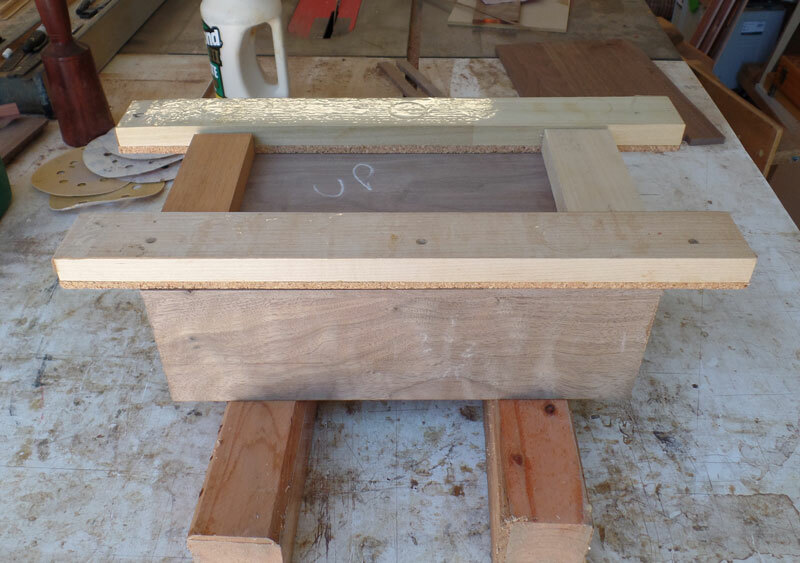 Since the top is a bit big, and the sides are a bit more than 1/2", this should prevent any raw wood from showing inside. I apply the wipe-on poly. Remove the blue tape and we're ready to glue the top on. 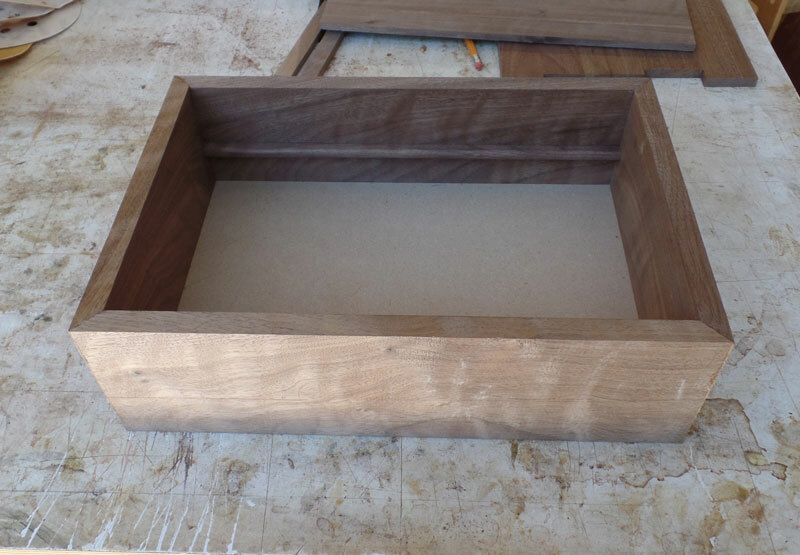 Now we're ready to glue the top to the box. 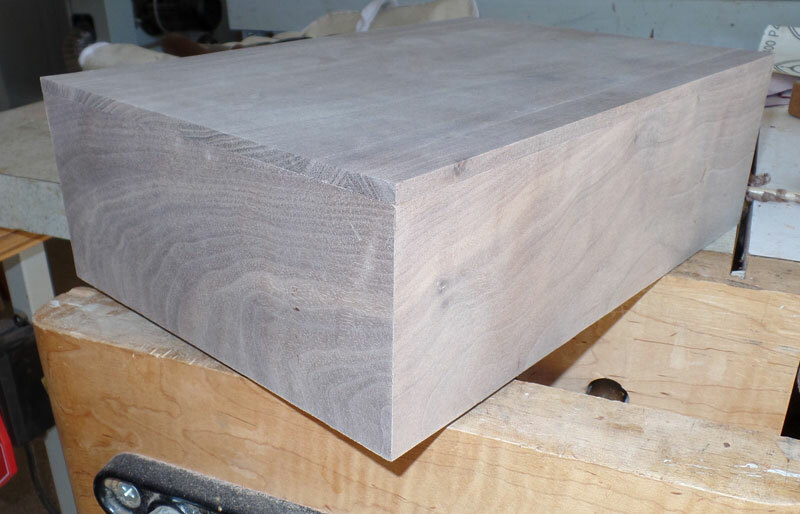 I'll use cauls when clamping to make sure I get pressure all along the top. I put two boards under the box to space the box up high enough that I can get the clamps on easily. 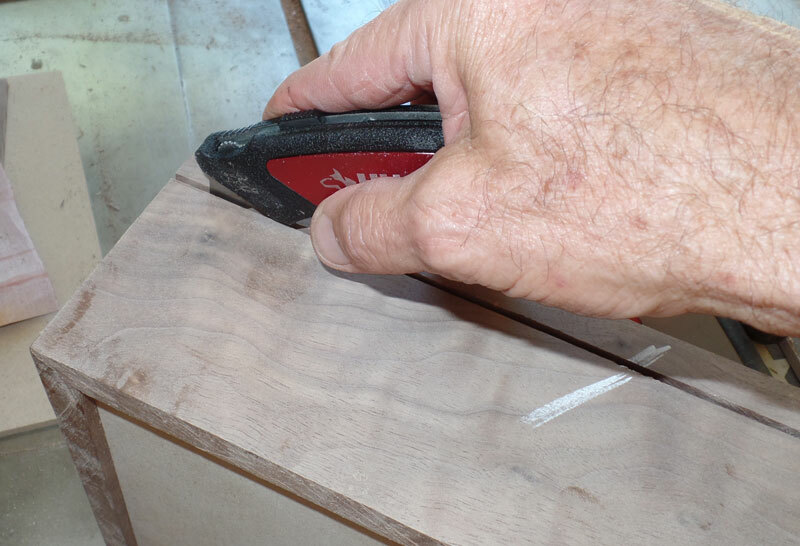 When applying glue, keep the glue to the outside of the sides. You won't be able to clean up any squeeze out inside the box so you want to not have any squeeze out there. I only put glue on the sides, not on the top. Carefully put the top on and press it down. Then remove the top and look at how the glue spread out. If some squeezed out on the inside, wipe it with a wet towel far enough back that it won't squeeze out any more. Then carefully put the top back on and keep your fingers crossed. Make sure the top extends out just a bit all around. Carefully put the cauls and clamps in place. 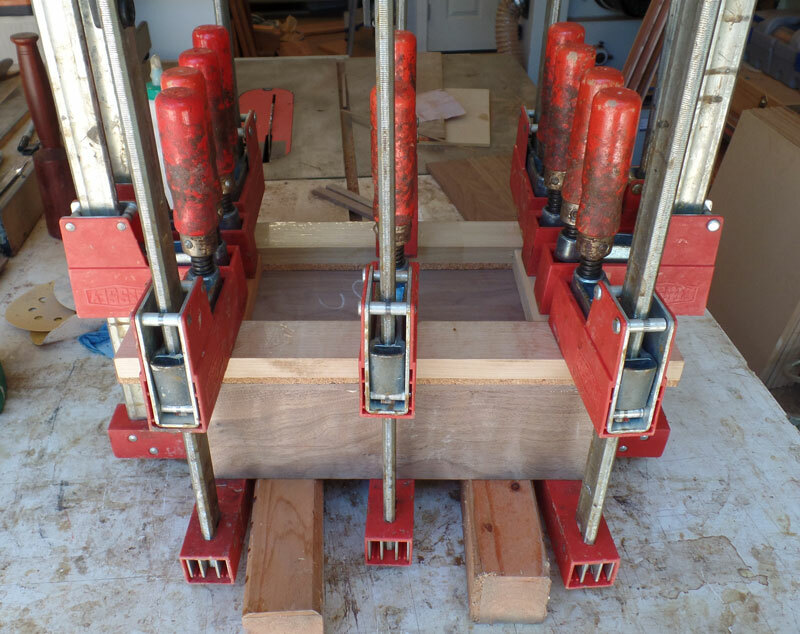 I used ten clamps on this glue-up. 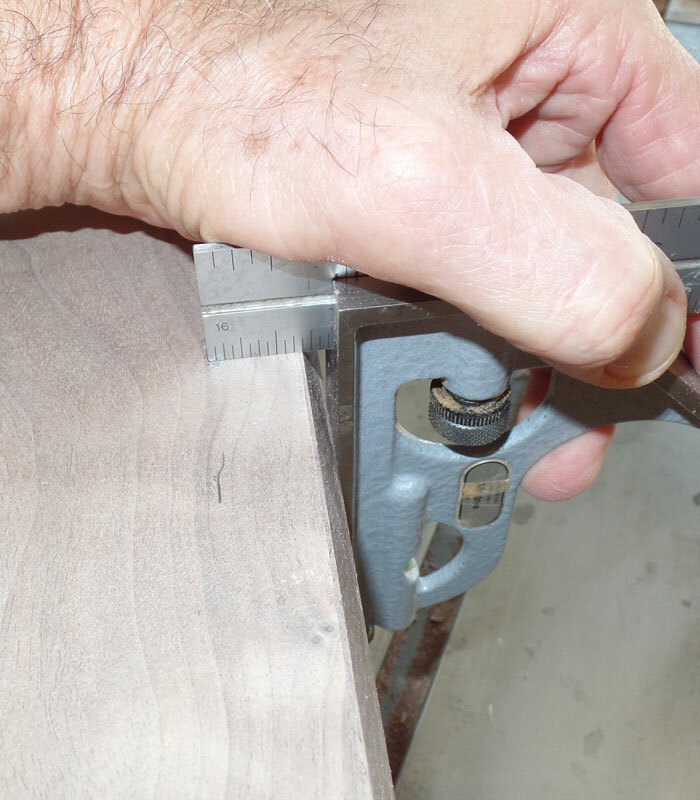 After the glue is well set, remove the clamps. 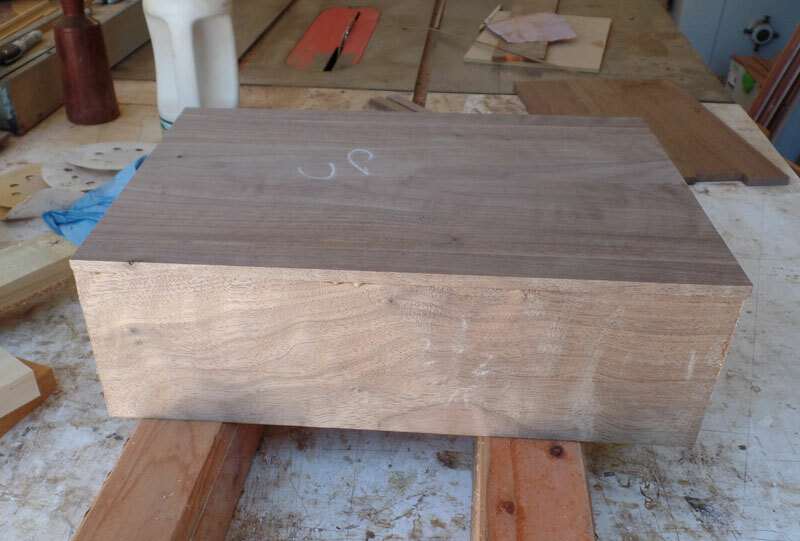 Take the box to your bench and put it in the vise. 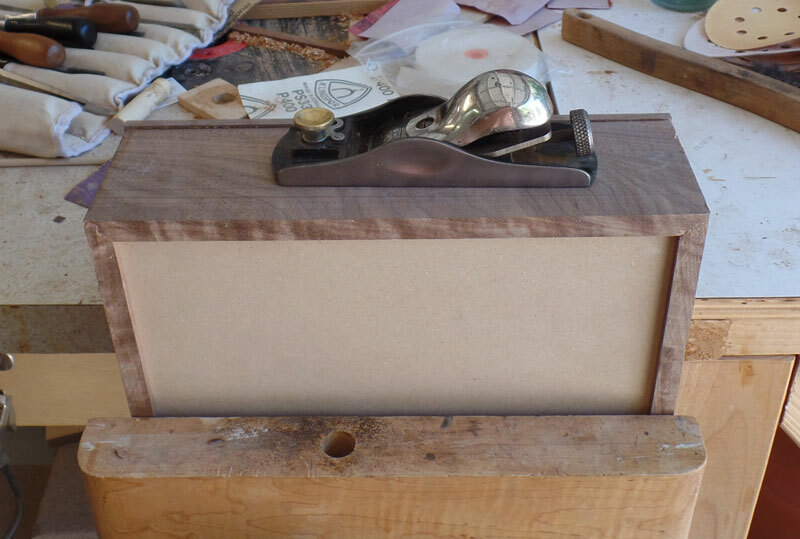 Use a sharp block plane and plane the top back to the sides. 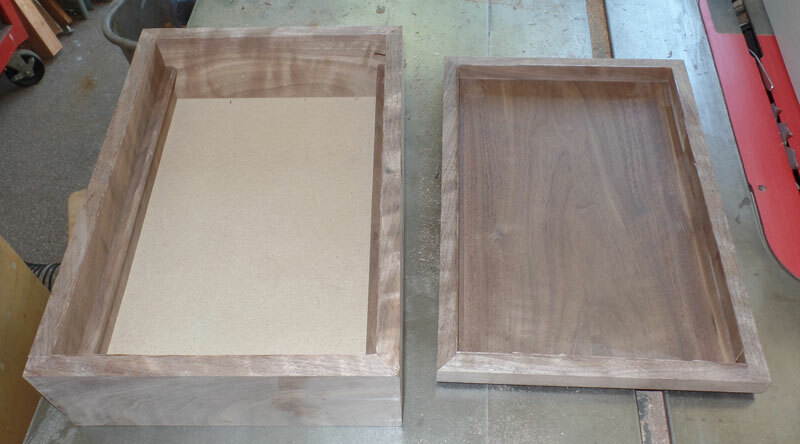 Then sand the sides so that the top is exactly even with the sides. Let me review the four sides. This corner is an exact grain match. Note how the grain flows around the corner. 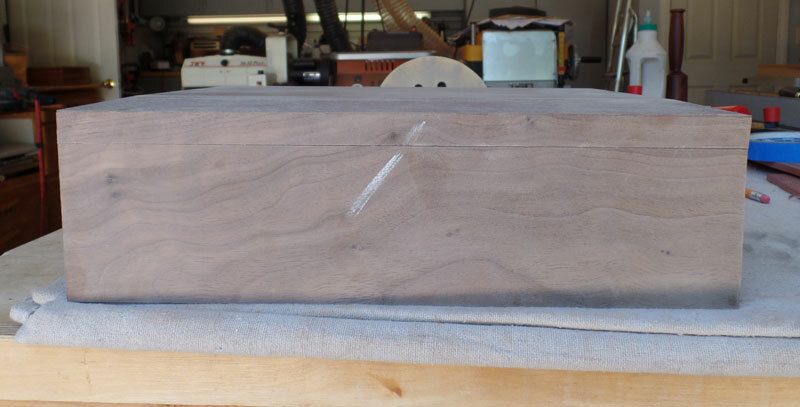 This corner is not an exact grain match but it looks close. 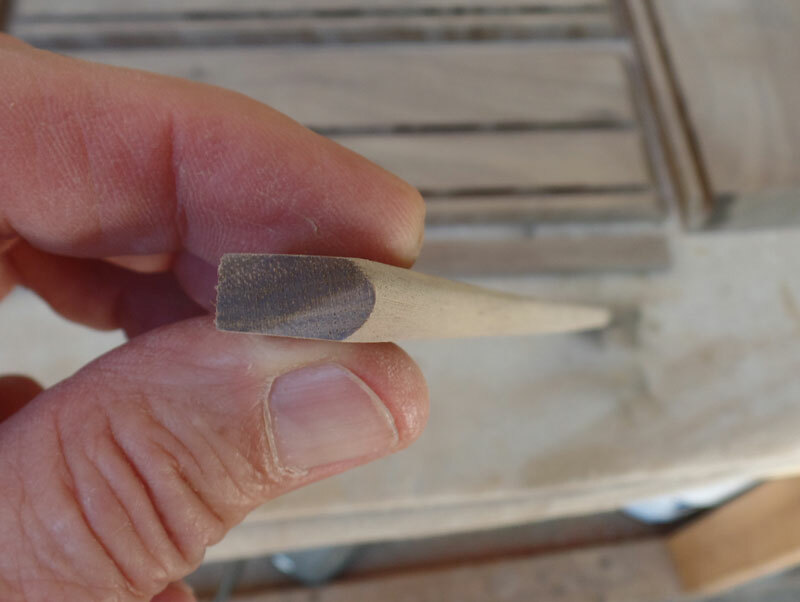 This next corner is an exact grain match. The last corner is not a very good match so it will go to the back of the box. The reason I have two non-exact matches is that I used two boards. If I had used one long board, I would have had three exact matches. 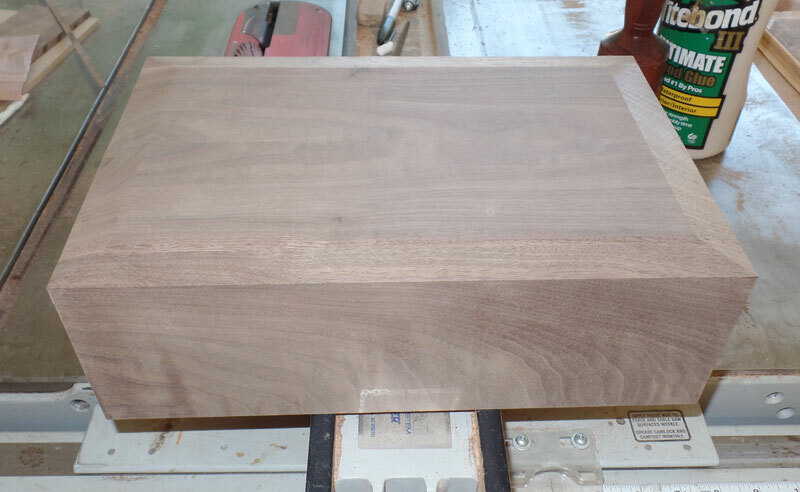 Next, I'm going to cut the bevels on the top. 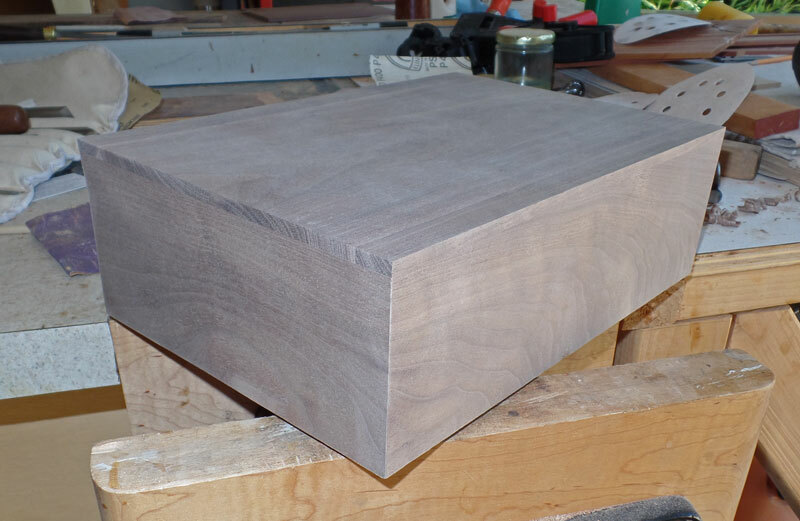 For a plain box - no veneer or carving on the top - it looks better with beveled sides on the top. There are a couple of ways to do the bevels. 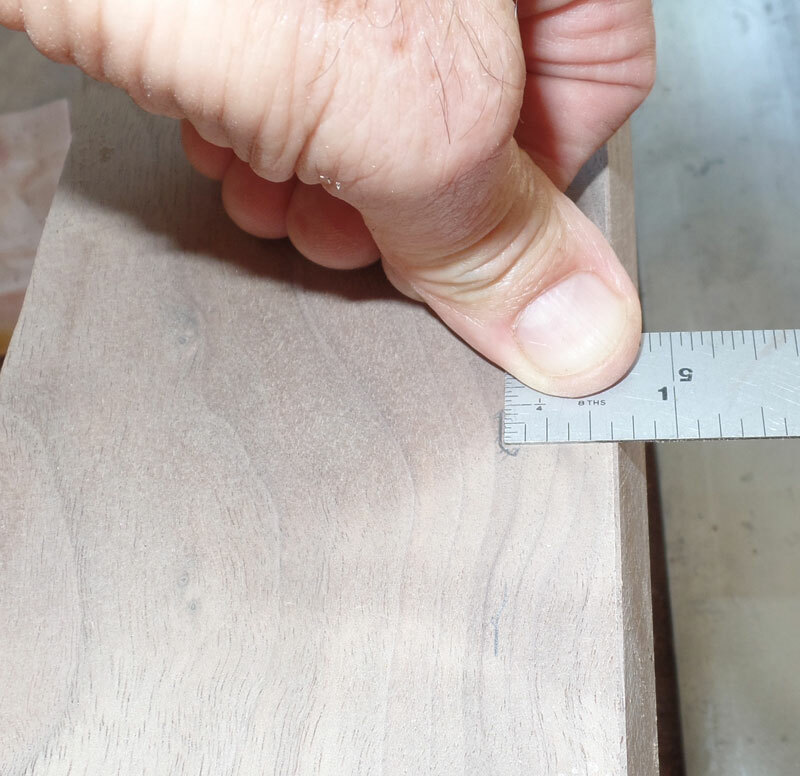 You can do them by hand with a marking gauge and a block plane, or you can do them on your table saw. I'm going to demonstrate the table saw method. Set the blade at an angle of about 12 degrees. There's nothing magic about 12 degrees so if you like more or less angle, go for it. Start by adjusting the fence so that the box just touches the blade. Then tap the fence over slightly. Make a cut. Tap the fence over a bit more - make another cut. Continue this until you get the look you like. Then don't move the fence. Here's the bevel I chose. Now run the box through the saw for the other three sides. The box will look like this. Next, we will cut the top off of the box. 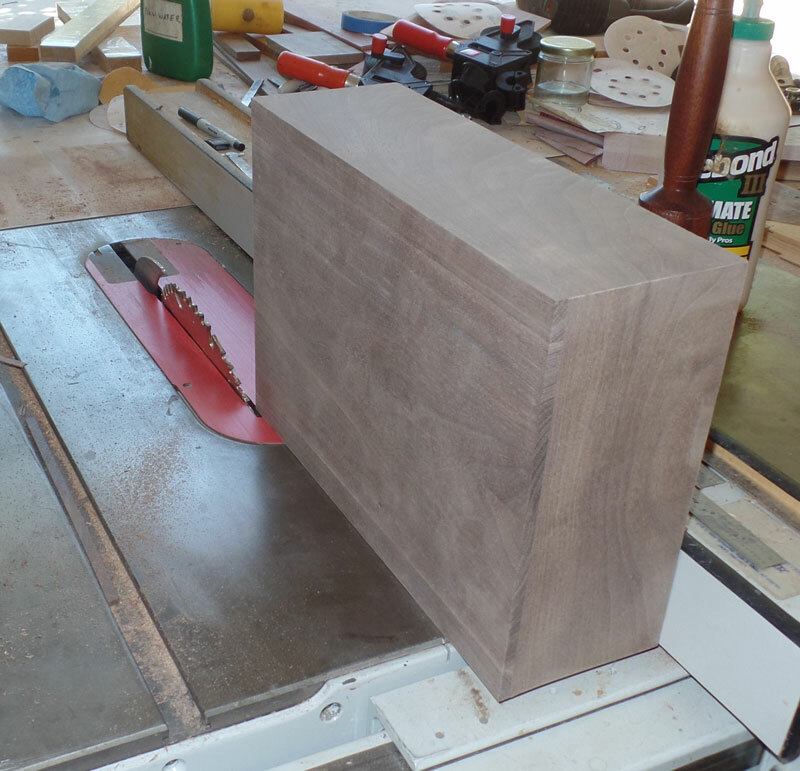 This can be done on the bandsaw or on the table saw. I'll demonstrate the table saw technique. Remember I told you to save your offcuts of the sides? This is where you'll use them. 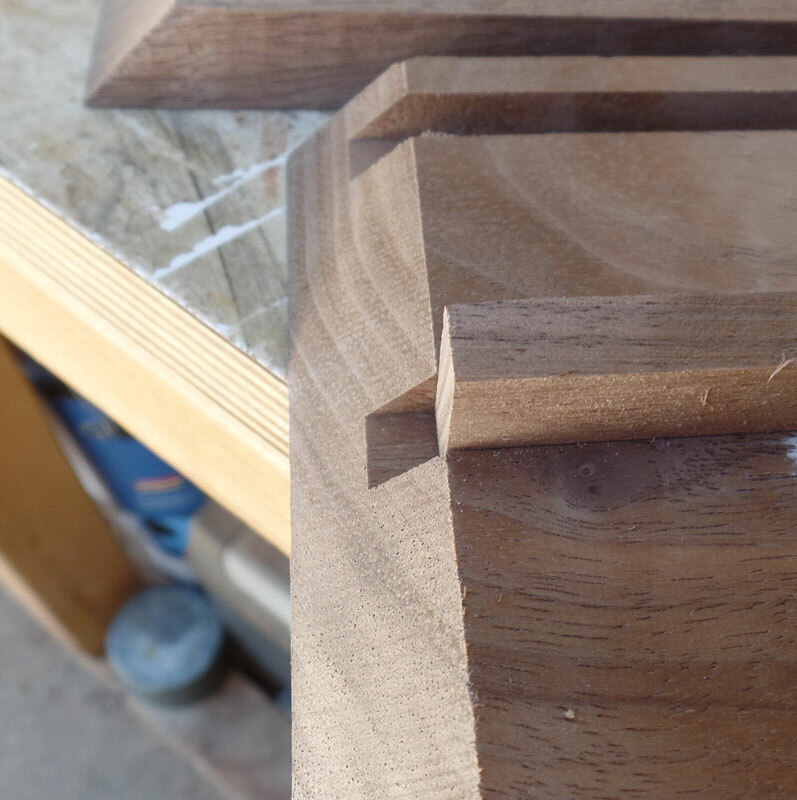 We want to make a cut almost through the sides, leaving enough to hold things in place. If you cut all the way through, you'll likely have a problem when you make your final cut. 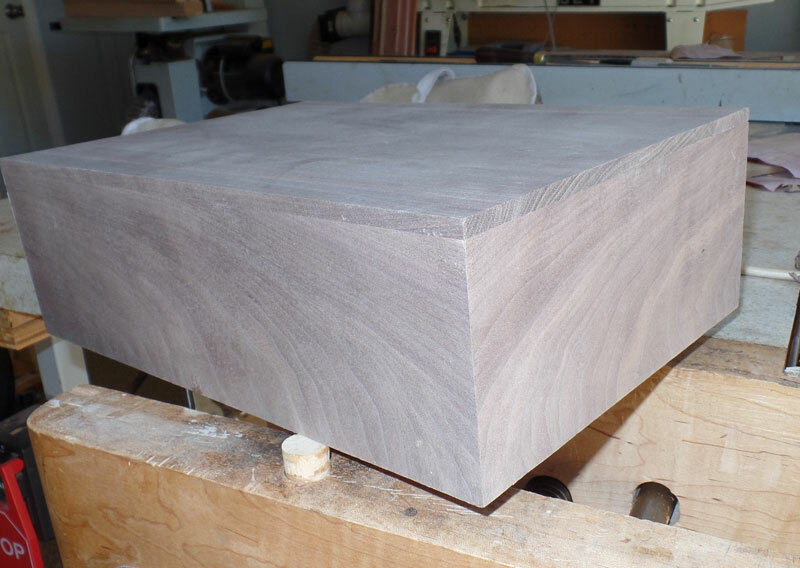 After making your cut on all four sides, you can finish the cut with a box cutter or a saw, such as a Japanese saw. Here's the offcut and how much I left. I seem to always leave too much but I'm afraid of going completely through. The next question is how far to put the fence from the blade. Remember that I had allocated 5/8" from the top of the side to the cut. But now I have the top on so I have to take that into account. First mark 5/8" from the top of the side. 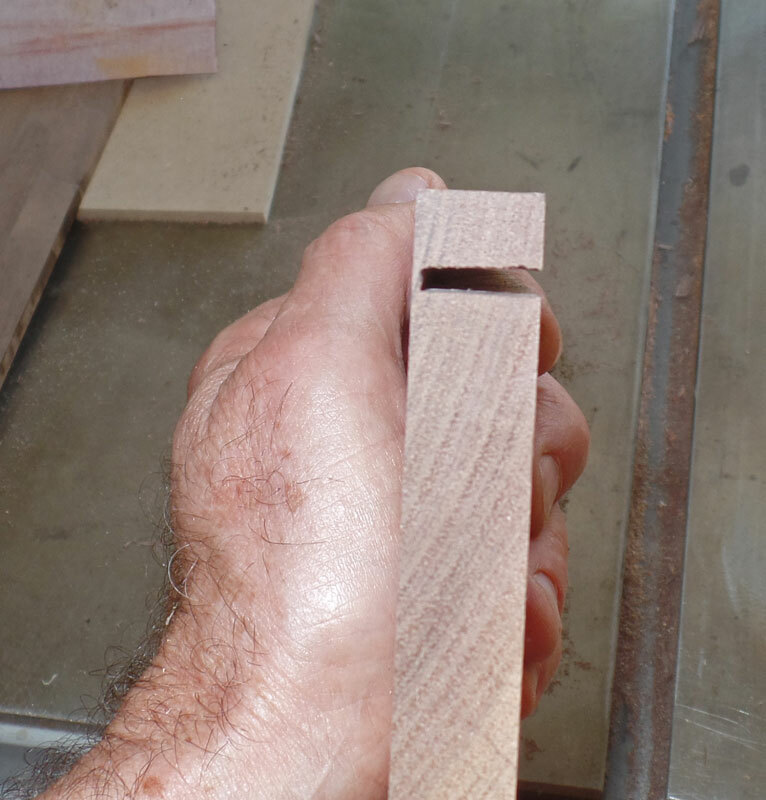 Then use a combination square against the top and move the blade out until it reaches the 5/8" mark. It turned out to be 7/8". Set the fence 7/8" from the blade. Note that I'm using a narrow blade (2 mm) to minimize the size of the cut. I'm not sure it's worth it. 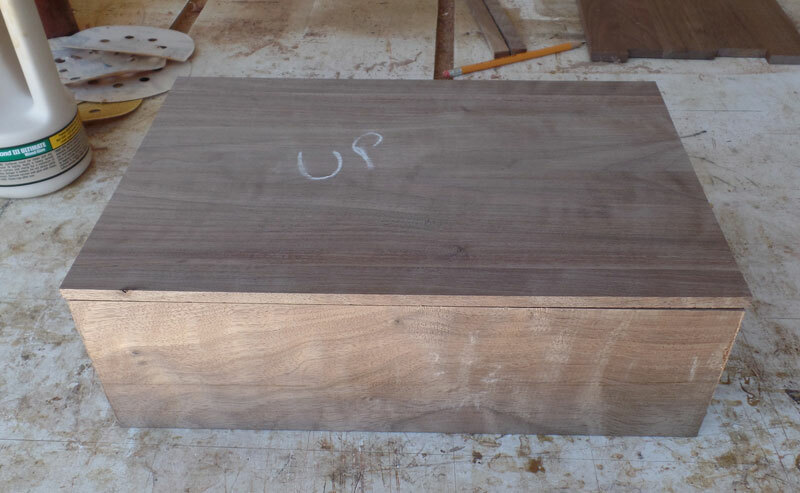 Here's the box with the cut along all four sides. The top is still being held on. I also put a chalk mark on one side so I'd be able to put the top back on properly. I used a box cutter to cut the top from the rest of the box. 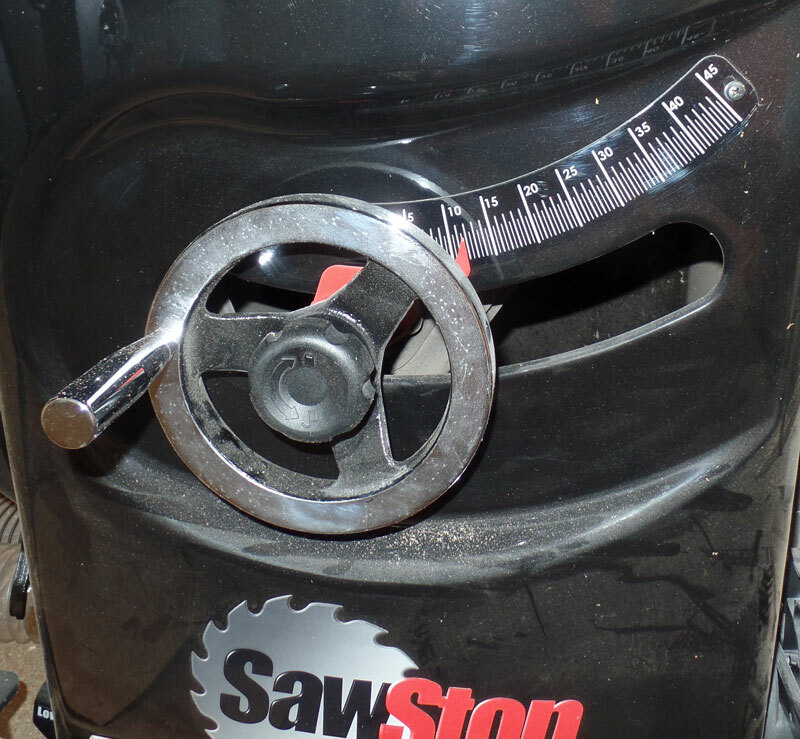 The first thing to do is to remove the small lip that is left from the saw cut. 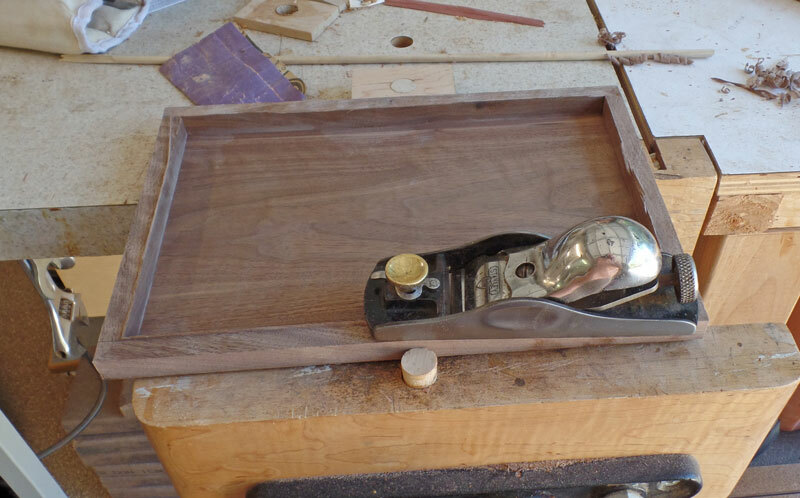 I use a sharp block plane for that. You don't want to have the small lip break off because it can split on the inside, leaving an unsightly edge. Do the bottom of the box, also. 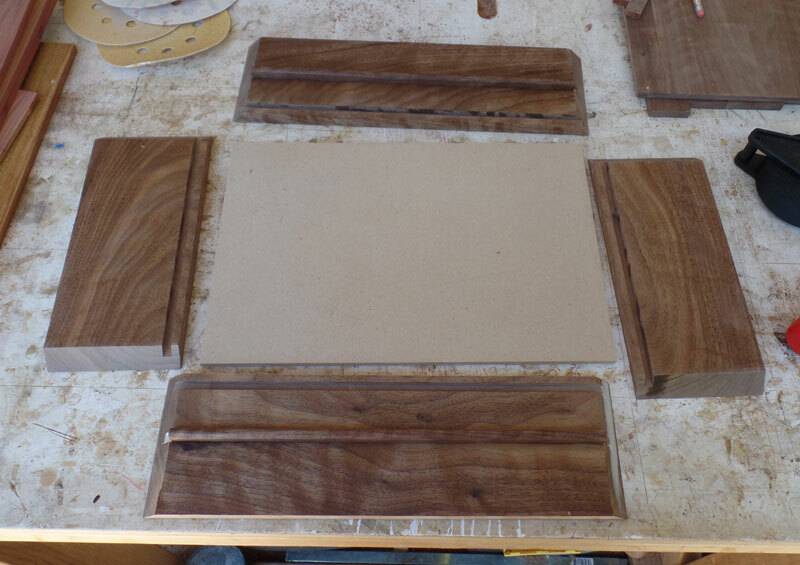 Then take both pieces to the sanding board and sand them flat. You should come out with a well fitting top. This fit is not as good as others I've done, perhaps because the top is so thin. Just a bit of space on the right side.